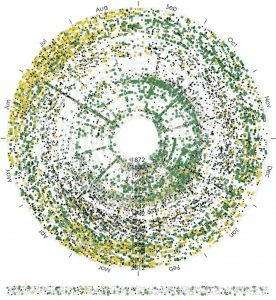 A new metaLab project is a study of the collection of trees at the Arnold Arboretum and the metadata built up around that collection for well over a century. “The Life and Death of Metadata,” led by Yanni Loukissas, views the trees and the metadata as living forms of information. The result of the project is a new kind of scholarly publication, a “data narrative,” about organizing the universe of knowledge. Each of more than 70,000 of trees, shrubs and vines, or “woody plants,” brought to the Arnold Arboretum since 1872 has been meticulously documented with rich descriptive information, or metadata. The practices of classifying, describing, and cataloging the plants–the creation of metadata according to the standards and technologies of the times–have been equally well documented; this is one reason why Loukissas and his colleagues at metaLab have been using the Arboretum as a laboratory for studying how historical metadata can reveal the underlying process of research and discovery. 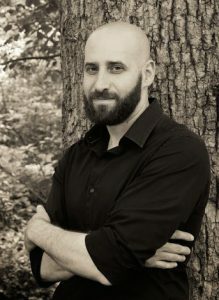 Loukissas, an architectural and media designer, possesses a unique ability to observe how the material and virtual worlds intermingle. After studying the practices of metadata creation employed at the Arboretum, he began to view individual pieces of metadata as living things, with social, organizational and temporal characteristics, and the trees as carriers of complex informational significance in this park where, in his words, “being is a form of information.” “Like the treasures held by other types of museums, the individual plants in our landscape hold value through their provenance and the accumulation and dissemination of relevant information about them,” states the Arboretum website. Entering the collection of woody plants in the Arboretum is a rite of passage to an (informationally) higher level of existence. Most of us who have visited the park are familiar with rectangular labels attached to tree trunks; they represent only one type of the many metadata forms, formats and fields that the Arboretum maintains. Whether hand-written or printed on index cards, fixed to a tree or digitized in the Arboretum’s BG-BASE database, the metadata has a life that starts and ends, a history that reflects the changing norms and practices of description and classification, and the organizational context in which it came to be. The Arboretum metadata fields include the plant’s source of origin, provenance, date of acquisition, botanical names and descriptions, and size, as well as notes about growth, hardiness, ornamental features, propagation techniques, susceptibility to insects or diseases, and more. The result of Loukissas’ studies, visits to the Arboretum and interviews with its expert staff is a radically novel form of scholarly publication. Called a “data narrative,” it is a web-based hybrid of two integrated texts, one told by the Arboretum metadata (in the left column) and one in the form of an essay (in the right column). The data set, representing the totality of accession events of all the plants in the Arboretum collection from 1872 to 2012, is integrated with a timeline created by the Arboretum’s renowned horticulturist Peter Del Tredici. Each year line is paired with a corresponding monthly accession graph, as well as description of each plant that entered the collection, as shown below. As the story of life and death of metadata is told on the scrolling right hand section of the essay, the data set joins the narrative essay by assuming different visual effects, for example showing the provenance type of plants (e.g. wild in green or a cutting in yellow) or country of origin (red represents plants brought from China) to illustrate the points discussed. and its visualization with interpretation and contextual reflection. It is also the perfect form to elevate the material, social and cultural importance of metadata, in contrast to standard perception of metadata as mere pointers to something else, deprived of its own inherent intellectual value. However, even with the best metadata available and novel visualizations exposing trends and patterns in the data, the universe of knowledge will always evade our ability to catalog and organize it, according to Loukissas. As we are only beginning to learn how to combine data analysis with reflection and interpretation, our ability to “map” the universe of knowledge will depend, ultimately, on mastery of all the forms of organization and explanation available to us–data and text-based, visual, virtual, material and social.